There has been a lot of discussion in the Australian media over the last few days or so in regard to whether Australia should adopt an American style ‘tipping’ culture. In America there it is expected that you will tip at least 15% at least in hospitality. To adopt this practice in Australia would be a backward step as far as I am concerned. Firstly, in America well paid hospitality staff can receive about $300pw if you look at about a 38 hr week as a salary however it’s more likely to be around $120. In Australia the minimum wage in hospitality is more than $600 for an adult. 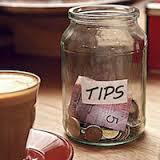 I have seen plenty of comments from people in hospitality in Australia saying they need more and should be tipped. I would expect comments like that. However I have also seen many Australian hospitality workers commenting that they don’t want tipping and feel that they are paid adequately. My issue is with the concept of tipping. Really if you look at it tipping in America is treated like a tax. You go out to dinner, look at the menu and automatically add at least 15% to work out the price just so you don’t get caught. It’s listed as a tip but you don’t really get a choice. However because of the low pays you are certainly likely to get better service because the staff are looking for more. I have no problem in this scenario paying the extra. The other factor that you need to take into account is that food in the U.S is far cheaper. Ok, we know that American’s pay a lot less for food but the restaurant owner also can afford to decrease process because they are not burdened with the higher wage bill. However in Australia food is expensive and I like the fact that our hospitality staff are paid a fair minimum wage. There needs to be a standard. I would hate to see workers in this country have their base wages cut as this is their security. In saying this the standard of service in this country is appalling probably because they are paid a set wage, so they don’t have to put in the effort. The wise hospitality workers out there know that Australian’s will voluntarily tip if they can afford it and get great service. Personally I always carry extra cash when eating out just in case I get great service and although its rare to get good service it does happen. I will give a tip for great service even if the food wasn’t great because the service is important. Unfortunately the quality of food is also lacking across the board in this country. There is some great food to be had however it’s hit and miss a lot of the time. I will get back to the odd food review but really that’s a different issue. As far as I’m concerned I would hate to see compulsory tipping in this country because it’s only a substitute for paying acceptable wages. I like having the choice to tip and will continue to do so. To all the hospitality workers in Australia, if you give great service you will get tips but don’t expect them. We are not in the US and really you will be worse off if you were. Appreciate when you receive tips and know that if you receive a tip it’s because the patron appreciates and is impressed with your service levels.